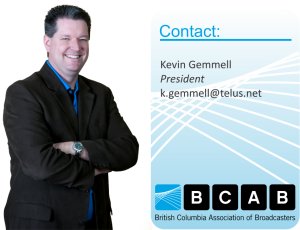 Preparations are now well underway for the BCAB 69th Annual Conference set to take place May 17-19 in Penticton. The Board of the BCAB has lined up an excellent slate of presenters along with the social opportunities we all wish to take advantage of. And a few more speakers yet to be named (and though unlikely, the above lineup is subject to change). The BCAB will also recognize Quarter Century and Half Century Club inductees. If there are any potential inductees in your operation, be sure to have them visit www.bcab.ca in order to be recognized this May. I look forward to seeing you in Penticton this May! The BCAB has been recognizing the “Best in Province” for radio and television commercials, station imaging, community service and news reporting for more than 50 years. Awards are presented to both large and small/medium market stations at the Awards Gala during the annual conference. For 2016, for every paid entry submitted, up to a maximum of 10 entries, you may purchase an equal number of tickets to the President’s Dinner and Awards Gala at a special reduced rate of $75 per ticket (regular price $98 – limit of 10 reduced rate tickets per account.) More details will be provided in the “welcome” email you receive when you register to submit entries. 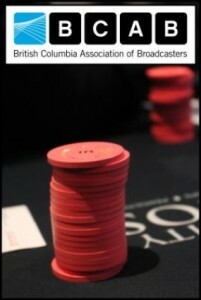 Back by popular demand is the BCAB Poker Tournament! This year there are a maximum of 33 seats available. Defending Champion Jerome Gignac MUST be defeated! Sign up to play NOW to do your part! We tee it up a the Twin Lakes Golf Course to kick off the 69th Annual Conference. You can register to golf as a single, or as a foursome. Plan to spend an extra day in Penticton and enjoy some of the BEST Golf in Canada. The BCAB Legacy Awards recognize 25 years and 50 years of service to the broadcasting industry. 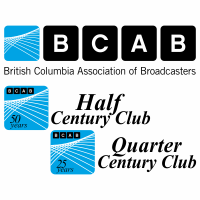 Each new Quarter Century Club and Half Century Club member recieves a Certificate of Recognition and a QCC/HCC Pin at the annual BCAB Conference held each spring. Please take a moment to pass this information around your companies. Any staff completing 25 or 50 years can apply. It’s FREE and you don’t HAVE to attend the conference to apply.